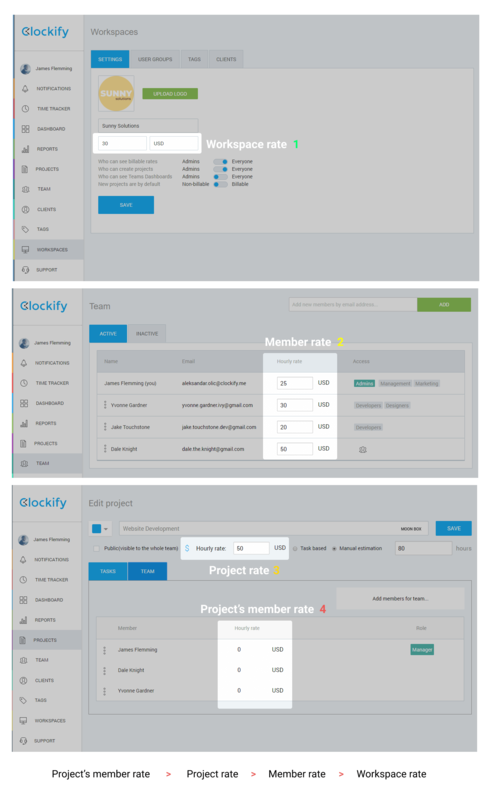 Clockify multiplies each billable time entry with their corresponding hourly rate and that number is shown as earning in a report. 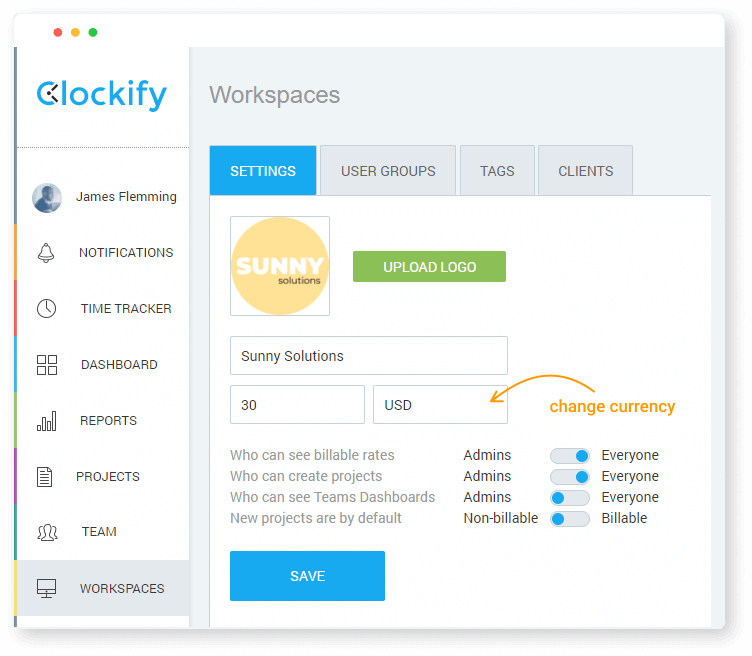 In order for Clockify to calculate hourly rates, you first have to mark time entries as billable in the Time Tracker (or in the Detailed report) by clicking on the $ sign. A more specific hourly rate overrides a less specific one: “Project’s member rate” overrides “Project rate” overrides “Member rate” overrides “Workspace rate”. For example, let’s say you’re a freelancer and you have a default rate you charge on all projects. You define that rate as your workspace hourly rate. Then, you also have a client to whom you charge a different rate. In that case, you can create a project, assign it to the client, and set the desired hourly rate for that project. Set the desired hourly rate for each project. You can’t assign a custom hourly rate for a specific time entry. But, you can use a tag to indicate a special hourly rate so you know how much to charge when preparing an invoice. To change currency, go to Workspace settings and type your currency instead of USD. Currency can only be edited by the workspace administrator and it’s applied to the whole account (including hourly rates). Only workspace admin can set hourly rates for workspace, user, and project. Project managers can set hourly rates for people on their projects. Regular members can’t see or edit any hourly rates. For more info, check out the Who can do what article. You can change whether time entries on a project are billable or non-billable by default. You can set project’s default billability status of time entries by clicking on the $ sign (it’s between visibility and hourly rate) on the “Edit project” page. If you set the project as billable, when someone tracks time and doesn’t specify billability, the time entry will be marked as billable (which you can edit later).